This article reviews the latest weekly sentiment survey we conduct over on Twitter. The survey measures respondents’ equity and bond positioning/view – differentiating between whether the view is bullish or bearish for technical or fundamental reasoning. The latest results showed another lurch down in sentiment for equities, with the gains of last week being reversed along with a similar pattern seen in price. The deterioration in sentiment was driven by both technicals and fundamentals sentiment. Notably though the technicals net-bulls chart has been showing an interesting pattern which is mirrored in the headline index - that of bearish divergence. That is, there has been a couple of higher highs on price and lower highs seen in sentiment. The other thing worth noting is the week-to-week readings have been noticeably more volatile over the past few weeks - which goes to show how sensitive the market is at the moment, and how in my view people seem to be just waiting for an excuse to sell... but are equally concerned with not missing out should the market rip higher. But as noted in the latest Weekly S&P500 ChartStorm the bearish evidence is starting to build (various signals and indicators e.g. negative seasonality), and it lines up with what we've seen in this survey - a general move towards more bullishness on bonds and bearishness on equities. So the waiting game continues. 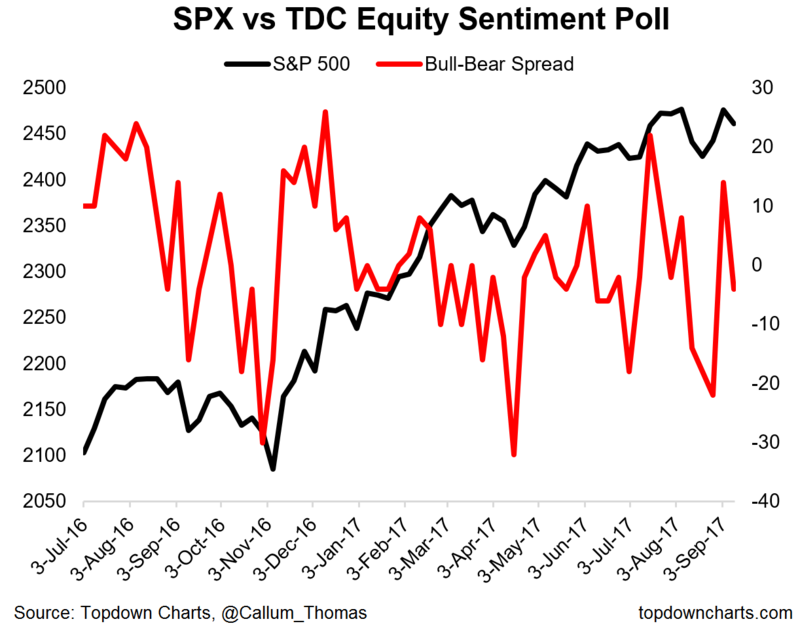 In contrast to price, the overall bulls minus bears spread has made lower highs and lower lows since July; a potentially bearish warning sign. Fundamentals sentiment has held up somewhat - more range-bound vs the increasingly erratic technicals sentiment - which is probably fair given the mixed signals on the technicals front, with breadth deteriorating vs various signals switching from overbought to oversold and back. 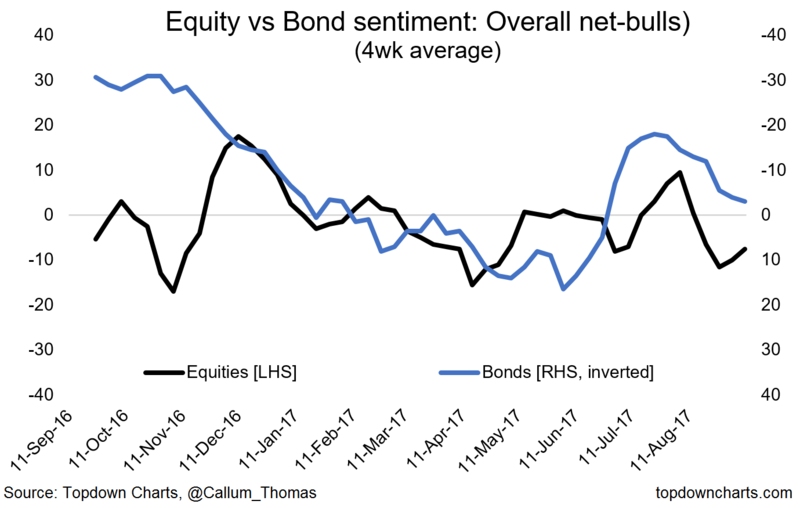 Overall sentiment has trended to the bearish side for equities and has moved more bullish for bonds - which is consistent with the traditional thinking in asset allocation, and reflects a reassessment of the outlook by the investor survey respondents.